Build a bigger bench press and chest with our top 10 chest exercises! In this article we will discuss the best chest exercises for developing a stronger and muscular chest for lifters, athletes, and everyday individuals. A big and strong chest not only looks great, but can play a major role in athletic success on the field and lifting on the platform. What are the chest muscles? Why is chest training important and who can benefit? Below is a breakdown of the individual muscles that make up the chest, along with the specific purpose of each. 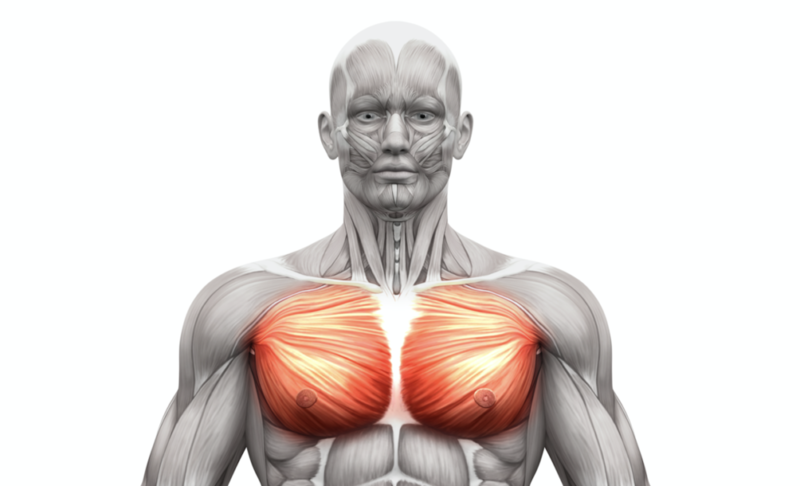 The pectorals are the primary muscles groups used in most pressing movements. The pectoralis major is responsible for multiple movements at the glenohumeral joint that are fundamental for athletic success, while the pectoralis minor has a heavy hand in promoting healthy scapula movement. The pectoralis major plays a role in flexion, extension, medial rotation, and adduction of the arm at the shoulder (glenohumeral) joint. The pectoralis minor lies underneath the pectoralis major and plays a vital role in abduction, depression, protraction, upward tilt, downward rotation, and stabilization of the scapula. Consider it the small backbone to a bigger press. Author’s Note: Some chest exercises below will also stress the shoulders and triceps, as they’re also prime movers in pressing movements. The amount of activation and stress will vary from exercise to exercise. Below are a few reasons to train chest, specifically for certain types of athletes and populations. Strength athletes should train the chest as it is a large upper body pressing muscle involved in upper body strength and maximal strength development. Powerlifters and strongman athletes can build a strong chest (and supportive muscle groups like triceps and shoulders) to enhance bench press performance and overall strength. The chest is a key upper body muscle group involved in pressing heavy loads, improving overall upper body strength, and can help you add serious muscle tissue to the upper body. Everyday lifters can benefit from training chest for all of the reasons addressed above, in addition to increased upper body strength and size. Aging individuals should train chest (and other compound movements and larger muscle groups) to help improve retention of lean muscle mass during the aging progress, This can often be key as muscle wasting can lead to injury, weakness, and decreased quality of life. Below are 10 (ten) of the best chest exercises for overall development, strength, and aesthetics. The barbell flat bench press is one of the most recognizable chest exercises across strength and fitness training. This exercise can be done with varying amounts of loading and used to develop raw strength and muscle hypertrophy. 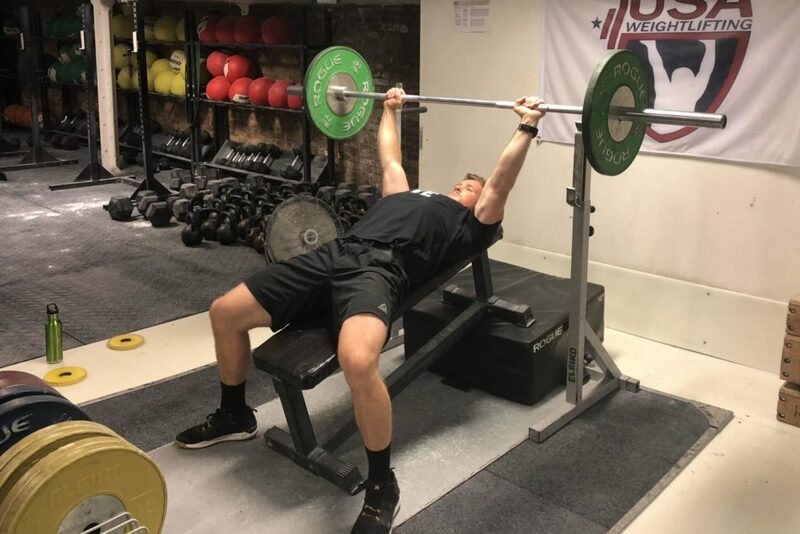 Below are three benefits of the barbell flat bench press that coaches and athletes can expect to gain when adding this classic into training programs. Increasing maximal strength is key for athletes and general lifters alike. The barbell flat bench press can be loaded with high amounts of weight and can be easier for those individuals who may lack coordination for heavy dumbbell training (note, you should still address the instability and lack of coordination with dumbbells). The bench press is a sport specific movement to powerlifting and should be trained by any lifters or individuals looking to compete in the sport (as it is one of the three competition lifts). This compound barbell lift builds muscle and strength in not only the chest muscles, but the anterior shoulders, triceps, and scapular stabilizers as well. Below is a brief guide on how to perform the barbell flat bench press.. Step 1: Set the upper back and hips to the bench, with the feet secured to the floor. The shoulder blades should pulled together to enhance stability and upper back strength. Step 2: Grab the bar (varying grips) and squeeze the hand hard to maximally flex the arm and grip muscles. Step 3: With the load unracked, think about pulling the barbell to the body, so that it touches the sternum/base of the chest. Step 4: Press the load upwards, making sure to keep your back set and shoulder blades pulled together. Take a look at out our Bench Press Exercise Guide and learn more about training progressions, programming, and advanced variations. The incline bench press can be done with a barbell, dumbbells, or machines to increase strength and muscle activation of the upper chest. 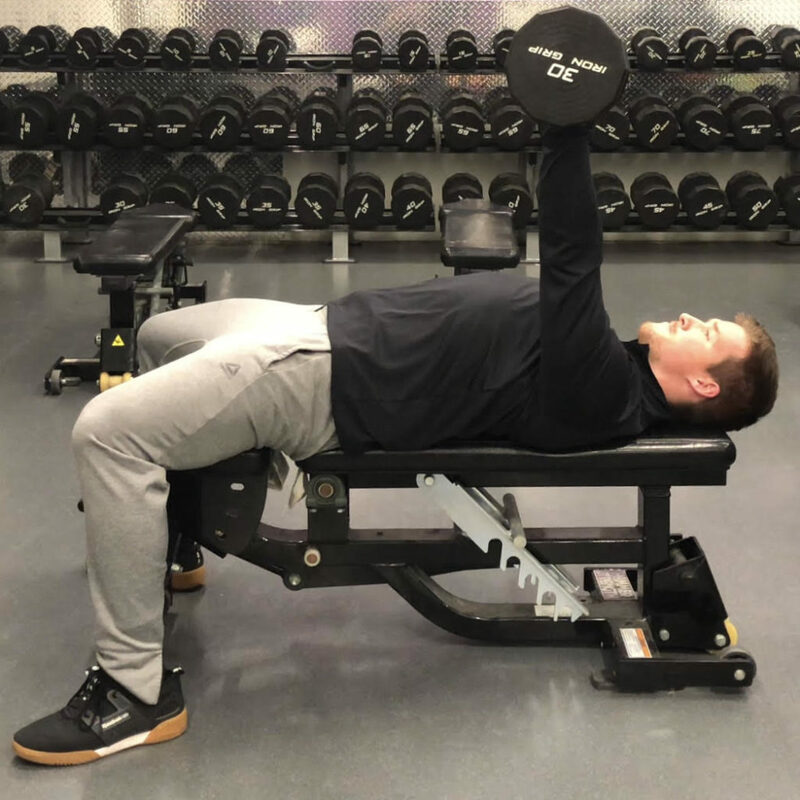 Below are three benefits of the incline bench press that coaches and athletes can expect to gain when adding this movement into training programs. The incline bench press can be used to increase upper pectoral/chest strength and size due to the angle of the movement and load. The incline bench press can be done to diversify pressing strength and add more strength and muscle mass; often due to adding variation to a training movement. In some instances, an athlete/lifter may have limitations to performed completely vertical overhead training (maybe due to discomfort and/or injury). The incline bench press can be done to introduce overhead training and develop applicable overhead strength throughout the recovery process. Note, if you are experiencing pain/discomfort in an exercise, that is not normal. Be sure to address this with a professional. Below is a brief guide on how to perform the incline bench press. Step 1: Start with the bench on a 15-30 degree incline, and get set up similar to that of the flat bench press. Step 2: With the load over the upper pectorals/shoulders (once you have unracked it), pull the load downwards so that it is in line with the upper chest (a few inches below the clavicle). Step 3: With the scapular muscles pulled tightly together and elbows angles inwards towards the body at roughly 70 degrees, push upwards through the load, focusing on feeling the upper chest being responsible for the movement (rather than the anterior shoulders). Take a look at out our Incline Bench Press Exercise Guide to learn more about this upper chest building exercise. The decline bench press, like the flat and incline versions, addresses strength and muscle hypertrophy of the lower chest muscle fibers. This can be done with dumbbells and/or a barbell. Below are three benefits of the decline bench press that coaches and athletes can expect to gain when performing the decline bench press. The decline press targets the lower area of the pectorals due to the angle at which the press is performed. The decline bench press may be used to slightly decrease strain on the shoulders and increase chest and triceps development. The decline bench press can often be done with more loading than the flat and incline variations, meaning you may be able to subject the chest to heavier loading and higher strain to induce new muscle growth. Below is a brief guide on how to perform the decline bench press. Step 2: Unrack the weight and pull the load downwards toward the sternum, all while keeping the shoulderblades pulled together. Step 3: Press through the load using the lower aspects of the chest muscles to lock out the elbows. Be sure to not allow the elbows to excessively flare out in the movement. 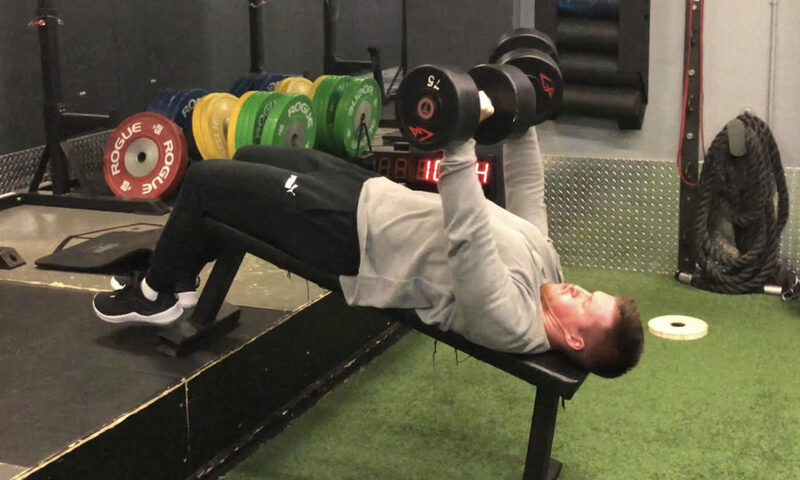 Take a look at out our Decline Bench Press Exercise Guide and learn how the decline bench can boost your chest development. The cable flye is an isolation exercise that can be used to increase muscle activation and hypertrophy of the chest muscles. This exercise is ideal for specially targeting the chest muscles; not allowing secondary muscles like the anterior shoulders and triceps to assist in the movement. Below are three benefits of cable flyes that coaches and athletes can expect to gain when adding this isolation exercise into training programs. Increasing the variety of angles that the chest is trained can help to stimulate new muscle growth and induce new level of muscle soreness to the chest muscles. The cable flye can be used to induce high amount of strain and fatigue with minimal loading due to the cables ability to keep tension on a muscle throughout the entire range of motion. This can be helpful for inducing greater muscle contractions and enhanced hypertrophy of the chest muscles. While most movement can allow a lifter to actively contract a muscle (voluntary muscular contraction), the cable flyes often allow for them to better isolate the pectoral muscles during this phase, which can be helpful for increasing overall development. Below is a brief guide on how to perform cable flyes. Step 1: Set the cables to a desired angle, and grasp the handles so that you are facing away from the weight stack/anchor. Step 2: With the shoulder blades pulled together and the chest up, extend the arms out in front of you (grasping the handles with them almost touching). Step 3: You should immediately feel the inner chest muscles working as they resist the tension, and always actively flex at this top position, making sure to not lose tension. Step 4: When ready, pull the arms open as if you are giving a wide bear hug, making sure to pull the handles outwards and not solely backwards. The key here is the width of the flye, not necessarily depth. Step 5: Once the handles have come in line with the body, or slightly behind, pause and hold tension in the middle chest briefly, making sure the shoulders do not collapse forward and the shoulder blades are staying pulled together. Step 6: Push the hands together in the same arching movement you took while loading the flye, focusing on a smooth and aggressive contraction (both from the loading and you purposefully flexing the chest muscles). 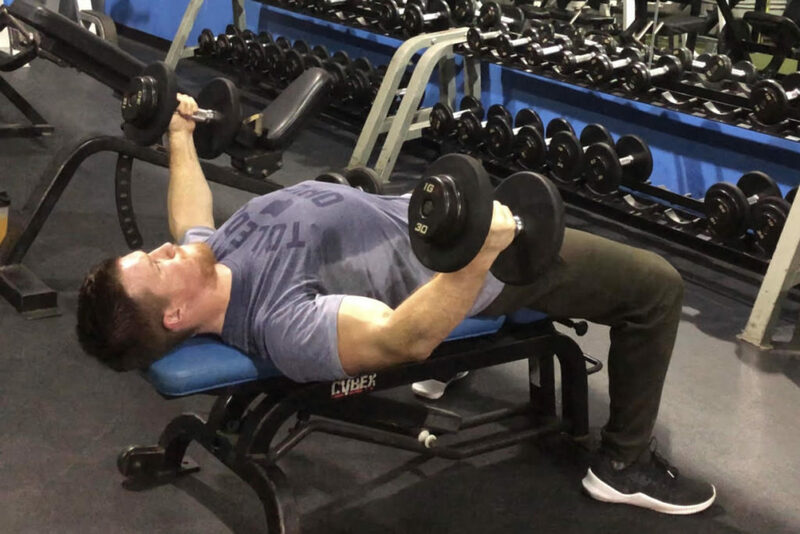 The dumbbell flye is a flye variation that can be done to isolate the upper, lower, and entire chest muscles depending on the angles of the bench (flat, incline, decline). The benefits of this isolation exercise are very similar to that of the cable flye, however with a slightly different stimulus. Below are three benefits of dumbbell flyes that coaches and athletes can expect to gain when adding this free weight isolation exercise into training programs. The dumbbell flye can be manipulated slightly easier than when using cables as the lifter can change the angles and wrist positions easily and within a set. The dumbbell flye is an isolation movement that can increase muscle engagement and hypertrophy of the chest without allowing assistance muscles like the triceps and anterior shoulders to be subject to some of the loading demands. Like most dumbbell training exercises, the dumbbell flye can be a great way to unilaterally isolate and train muscle coordination and increase muscular hypertrophy and strength. Below is a brief guide on how to perform dumbbell flyes. Step 1: Set yourself up on a bench the same way you would if you were performing dumbbell bench presses, with the only exception being that the palms are facing one another. Step 2: While keeping the shoulder blades pulled together, chest up, and elbows slightly bent, pull the weights apart in a wide arcing motion, much like a bear hug. Step 4: When you have reached the bottom of the flye, pause and feel the tension on the chest. Note, you shouldn’t feel too much in front of your shoulders. If you do, you may be too deep or your hands are too narrow (not pulled outwards enough). Step 5: Lift the weights upwards using your chest muscles in a slow and controlled manner, in the same path you took coming downwards, focusing in flexing the chest muscles at the top of every rep.
Take a look at out our Dumbbell Flye Exercise Guide and boost your chest development and size. The dumbbell bench press is a unilateral variation of the barbell bench press that can be done using a flat, incline, or decline bench angles. Below are three benefits of the dumbbell bench press that coaches and athletes can expect to gain when adding this variation of the barbell bench press into training programs. Increasing unilateral strength and muscle mass via the dumbbell bench press can help to address any asymmetries and address bilateral limitations in the movement. The dumbbell bench press challenges shoulder stability and scapular control as it requires greater coordination and awareness from the lifter. Unlike the barbell, the dumbbells move independently from one another, making it a slightly more complex exercise in terms of coordination and stability needed. The dumbbell bench press can be easily modified to allow the lifter to pronate/supinate the wrist during the press, change angles, or increase depth (more than a barbell bench press) within the set, making it slightly more versatile if the need arises to offer various athletes more pressing options (maybe due to discomfort during certain angles, etc). Below is a brief guide on how to perform the dumbbell bench press. Step 2: With the elbows extended and the dumbbells stabilized in the locked out position, actively pull the weights dowards as you open allow the elbow to angle slightly into the body. The dumbbells themselves should be slightly wider than the torso. Step 3: Continue to keep the shoulder blades pulled together and the upper back pulled downwards towards the glutes. Step 4: Once you have reached the bottom position, press upwards through the load to bring the hands and dumbbells to the original starting position. Take a look at out our Dumbbell Bench Press Exercise Guide to learn more about this unilateral chest exercise. 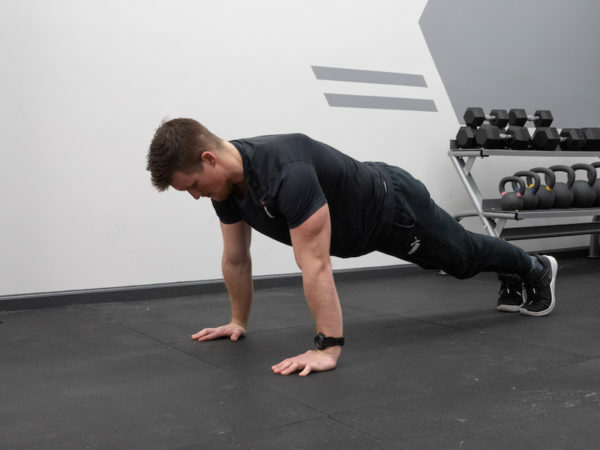 The push-up is a bodyweight exercise that should be mastered by all level lifters and athletes, as it can offer us a powerful chest training exercise (and upper body strength and mass movement) with zero equipment needed. Below are three benefits of the push-up that coaches and athletes can expect to gain when adding this bodyweight exercises into training programs. The push-up requires not equipment or special set up, making it a great exercise to train and integrate within any program (at home, vacation, large groups, etc). The push-up requires lifters to master their bodyweight and learn how to establish core and movement control, both of which are a necessary skill for more advanced chest and bodyweight/gymnastics training. The push-up is a foundational movement that can then be progressed into other forms of pressing. If a lifter can perform a sound push-up, there is a high probability that they have established good core and shoulder stability, have foundational strength in the upper body, and can understand movement mechanics of more advanced progressions. Below is a brief guide on how to perform the push-up. Step 1: Start lying prone on the ground with the legs pressed together and palms on line with the sternum (about 2-3 inches wider than the torso). Step 2: Pull the shoulder blades together, squeeze the glutes, and press the thighs together to create tension in the legs and torso prior to the push up. Step 3: Press through the palms so that your thighs, stomach, and chest simultaneously come up off the floor, continuing into the top of the push up position (elbows extended, core tight, upper back set). Step 4: Lower yourself downwards by pulling the back muscles together and allowing the elbows to angle onwards (70 degrees from body), ending with the chest, stomach, and thighs touching the floor at the same time. Repeat. 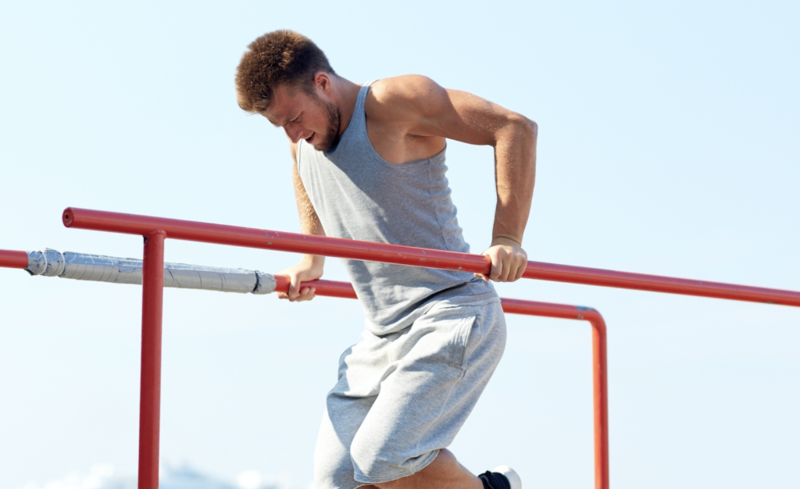 The dip is a bodyweight movements that can be used by strength, power, and fitness athletes to increase upper body strength, chest and triceps development, and improve gymnastics and bodyweight functional strength and stability. Below are three benefits of the dip that coaches and athletes can expect to gain when integrating the dip (and its variations) within training programs. Increasing lockout strength is necessary for the bench press and overhead lifts, and can be worked via the dips. The triceps and chest are responsible for finishing a heavy bench press, and therefore movements that isolate the triceps and chest can be used to aid in the overall development of a bigger bench and chest. The dip targets the chest muscles as well as the triceps, and therefore can be a great overall upper body pressing exercises to move heavier loads and add serious strength and muscle mass to the chest and arms (triceps). The dip is an advanced variation of the push-up, and can be used to further develop upper body strength and skill specific to bodyweight training and gymnastics. Below is a brief guide on how to perform the dip. Step 1: Grab the dip bar firmly and get yourself in the top of the dip position, with the upper back tight and shoulder blades squeezed together. Step 2: Angle your torso slightly forward and allow the elbows to bend as they slightly tuck inwards towards the sides of the torso. Step 3: At the bottom of the dip, you should have your elbows slightly pulled inwards and the body angles forward so that you feel the tension in the back of the arms and chest. Step 4: When ready, press through the handles and bring your body upright into the top of the dip position. Take a look at out our Dips Exercise Guide to learn more about the dip and its variations to diversify your chest training. The plate pinch is an isolation exercise that can build hypertrophy and increase muscle activation without needing to add high amounts of load to the shoulders or other parts of the body. Below are three benefits of the plate pinch press one can expect when adding them into a chest training routine. Isolating the chest muscles can be done with this movement as it requires a lifter to press plates together, staying in control and contract the muscle fibers. This exercise is often done with little weight, making it much less fatiguing on other muscles groups and mostly taxing on the chest. The plates must be constantly pressed together throughout the movement, which requires a lifter to remain in a contracted state and apply force for prolonged periods of time without any loss of tension; which can result in increased muscle activation and growth. In the event of an injury to the chest/shoulder joint (or wrist) the plate press may be a viable solution (much less than a bench press) as it often is performed with little load, done at controlled speeds, and uses time under tension and muscle engagement as its muscle growth stimulants. Below is a brief guide on how to perform the plate pinch press. Step 1: Start by taking two smaller weight plates (2.5 to 5kg plates) and pressing them together between your hands. Your arms should be extended outwards in front of you. Step 2: While actively pinching the plate together and not letting them slip apart (constant tension), pull the plates towards your sternum as you keep the chest up and shoulder blade pulled together. The arm angle should be about 70 degrees from the torso. Step 3: Once you bring the plates to the sternum area, flex the chest and press the weights back outwards, making sure to keep the planets pressed together and the inner chest muscles engaged. Take a look at out our Plate Pinch Press Exercise Guide to learn more about this isolation exercise. The floor press is a partial range of motion bench press that can be done with barbells, dumbbells, or kettlebells to isolate the chest, triceps, and lockout position in the bench press. 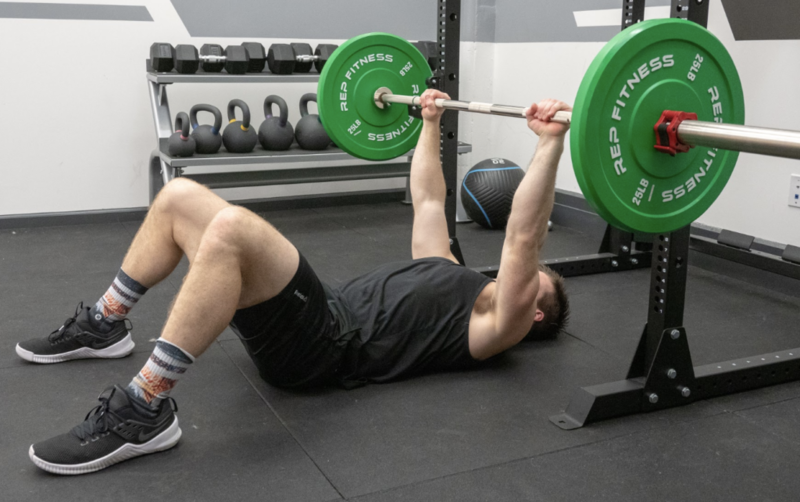 Below are three benefits of the floor press that coaches and athletes can expect to gain when adding this partial range of movement bench press variation into training programs. Increasing lockout strength via the floor press can enable heavier and more high volume bench press training, increased triceps size and strength, and improve overall pressing performance; all of which can build a bigger, stronger chest. The floor press can be used to increase triceps strength and muscle hypertrophy as the limited range of motion places a greater emphasis on the triceps ability to extend the elbow in the press. By limiting the depth at which the bench press is done, the floor press mitigates some of the strain and stress placed upon the shoulders in the bench press, making it a good option for more focused chest and triceps work and/or during times when lifters are looking to decrease shoulder involvement in the press. Below is a brief guide on how to perform the floor press. Step 1: Start lying supine on the floor rather than a bench, with the back set and feet on the floor similar to that of the standard bench press. Step 2: With a firm grip on the bar, pull the weight downwards so that the elbows are angles slightly into the body as the bar approaches the floor. Step 3: The back of the triceps should hit the floor first in a smooth fashion, making sure to keep the shoulder blades pull aggressively together, minimizing any upward movement of the shoulders towards the ears. Step 4: To return the load to the top of the press, think about pressing your body deeper into the ground, making sure to not allow the elbows to flare out and/or the shoulders to come up off the floor at the end of the press. Take a look at out our Floor Press Exercise Guide to learn more about this lockout strength and chest building exercise. Looking to take your chest training to the next level? Check out these other helpful chest training articles for strength, power, and fitness athletes! 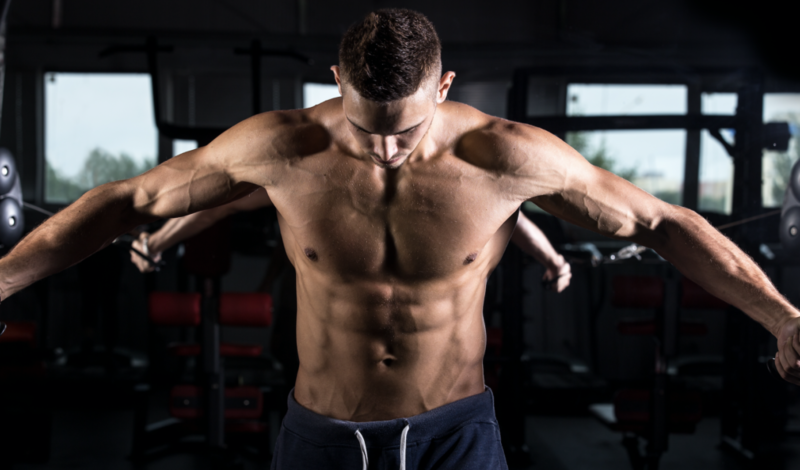 3 Chest Workouts to Build Size and Strength WITHOUT Weights!